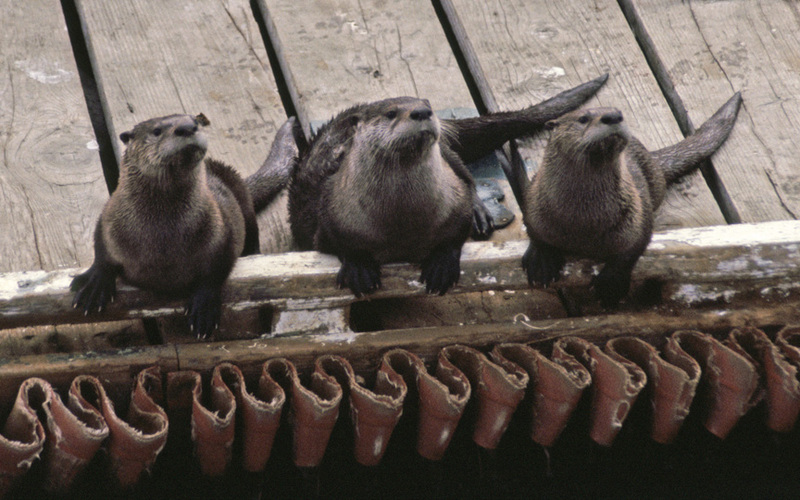 For 25 years, I have observed a population of seacoast-dwelling otters at Trinidad Bay in far-northwest California. From the beginning of my observations in June, 1983, to the end of 2007, I've seen my otters 4,796 times, which is probably more than any other living person has seen these animals in their natural state. It has been the greatest privilege of my life to chronicle the history of 5 generations of otters here. Although these otters make their living in the sea, they are not the familiar sea otters of the central California coast. My critters are North American otters - the species Lontra canadensis - what are commonly referred to as "river otters." Of all our native wildlife, river otters are usually among the most difficult to observe. Over most of the U.S., otters are trapped and persecuted by man, so they are typically very wary of humans. My otters are so easy to watch precisely because no one here harms them, so they have no reason to hide themselves. In these pictures, you will see that the otters live in close association with humans, at least during the summer months. Don't let the manmade props deceive you; this drama is very real. These otters may appear tame, but it is more accurate to describe them as casual. Humans are a neutral presence to them. They pay so little attention to people, I don't think they even recognize me, despite my having been in their immediate proximity on literally thousands of occasions. (November 30, 2002) Article: The Origin of the "River Otter"